Made for a wide range of sound reinforcement applications, the K8 represents a very popular power range. 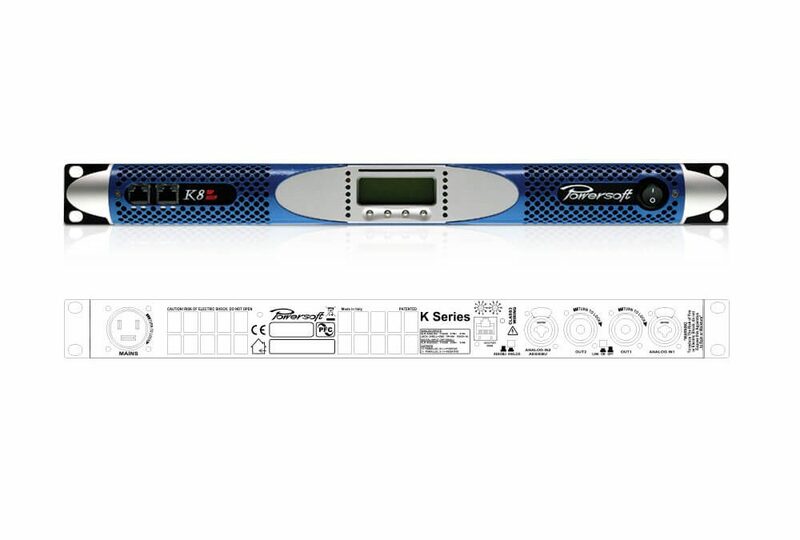 Occupying no more than a single rack space, it is a classic power source for mid-sized touring systems, and a safe investment as well: Per Step-up card a K8 can be upgraded to become a K10 – more power without replacing the entire amplifier. Click here to go to the K Series Step-Up page. Fully digitally controlled and with a serial PC communication port as standard, the K8 is also available with KDSP board and KAESOP Ethernet/AES3 interface: the K8 DSP+AESOP amounts to a fully integrated, highly sophisticated yet easy to use power source including state-of-the-art sound shaping and system management capabilities, remotely controllable via Powersoft’s Armonía Pro Audio Suite™ (Interface available for MediaMatrix, Crestron, AMX, Q-SYS control and monitoring systems).